When the German Army invaded Russia in 1941 during Operation Barbarossa the Red Army rushed to put every armoured vehicle they possessed into the front line to meet this dangerous threat. This included dragging out of retirement the obsolete T-18 light tanks from tank training schools or depots. These two man tanks were armed with a 37mm French Hochkiss M28 main gun and parallel twin 6.5mm Fedorov Avtomat machine guns. In 1928 the main gun was replaced with the Soviet designed and built 37 mm PS-1 Peter Syachentov gun. In 1929 they were rearmed with two 7.62 mm DT-29 Degtyaryova Tankovy machine guns. The crew were protected by armour that ranged from 6-16 mm thick. The tank was powered by a vertical, four-cylinder MS engine that produced 35 hp. It had a top road speed of 17 km/h (10mph) and an operational range of around 50 km (31 miles). They saw action defending the Kiev-Voronezh line in the summer of 1941. After World War One the Allies supplied the White Russians with tanks to help them fight the communist Red Russians in their civil war of 1919. Most of them were captured by the Soviets. 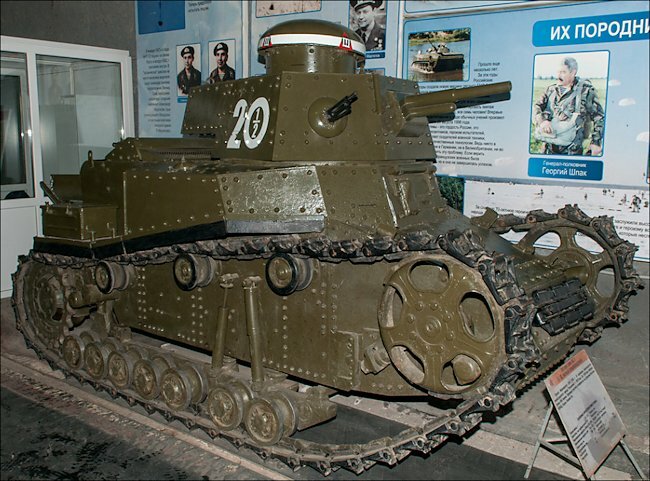 The Red Army was particularly interested in the French Renault FT light tank rather than the heavy British Mark V tanks. 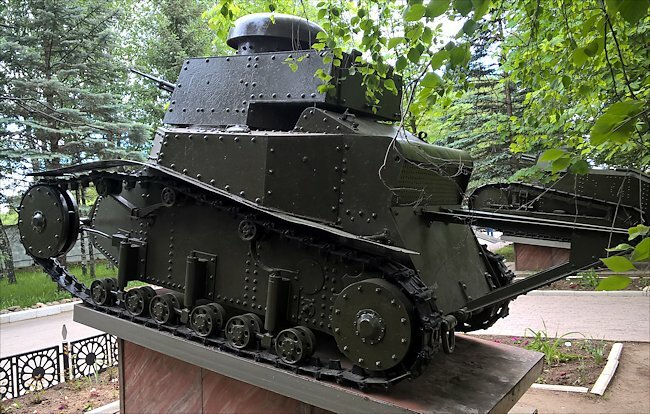 In the 1920's they made their own replicas of the Renault FT. This experience lead to the setting up of the Russian 'Tank Bureau' in 1924. The first army specification for a new Russian designed and made 'Maliy Soprovozhdeniya-perviy' MS-1 tank were issued. In English this this translates to 'first small support vehicle'. The result was the T-16 that had a lot of similarities to the Renault FT design. Faults were spotted during testing and a new set of blue-prints were produced for an improved tank. This became the T-18. Production started in February 1928. The French 37mm Puteaux SA 18 Model 28 cannon was fitted to a Hotchkiss-system mantle in the turret. It had a good rate of fire of around 10-12 rounds a minute. It could fire shells that on explosion released shrapnel killing or injuring any nearby enemy infantry, horses and damaging soft skinned vehicles including towed artillery guns. 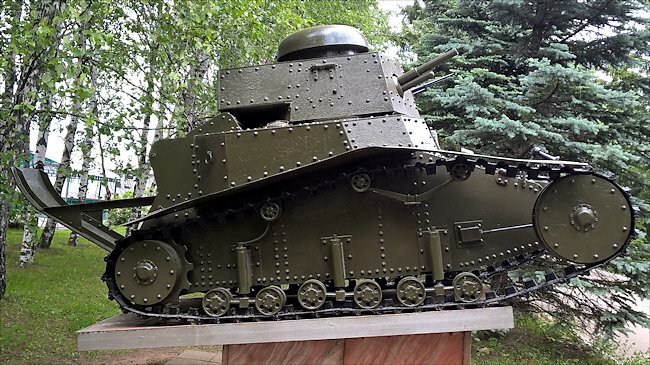 The Russian tank crew would have problems knocking out some of the new heavier tanks that were being produced by foreign governments in 1928. The tank gun was not powerful enough. 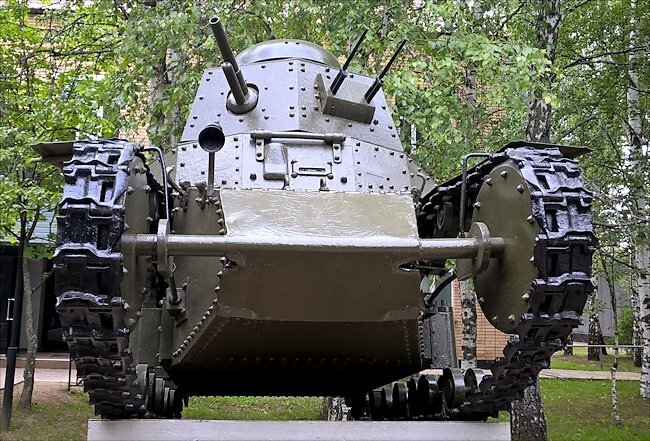 The double barreled turret mounted a 6.5mm Fyodorov machine gun fitted to the turret in a ball mount. The small turret was quite crowded. The commander was gunner, loader, machine gun operator, machine gun loader, navigator, target locator and risk assessor all at the same time. He also had to tell the driver where to go and keep up with the other tanks in his regiment. This was too much for one man and impeded on the operational fighting effectiveness of the tank. You will notice that the WW1 Renault FT 'ski' was fitted to the rear of the tank. This was to assist the T-18 tank when crossing wide trenches and prevent the rear of the tank sinking to the bottom of the trench whilst the front tracks tried to get grip and traction on the far bank and pull itself to the other side. Where can I find surviving T-18 Light Tanks?